Wreaths are typically door decorations, used both for sprucing up exterior doors and adding interest to interior doors. Some people also hang wreaths on their walls in place of pictures or enjoy decorating with wreaths laid down, for example as table centrepieces. In the autumn harvest motifs become very popular with florists' customers, and adding fruit to wreaths is an easy way to bring this theme into seasonal arrangements. Creating autumn wreaths can be done with fresh, dried or even fake fruit. Like autumnal flower arrangements seasonal wreaths tend to have rich colours. A colour schemes of yellows, oranges, reds and golds is particularly appealing in the autumn. Straw, twigs, fallen leaves, wheat, acorns, berries and grasses make excellent additions to autumn wreaths, and velvet or satin ribbons as well as raffia would be appropriate accessories as well. Wreath foundations made of foam, straw and floristry wire will support autumn wreaths, and wire picks as well as glue will help materials stay attached. 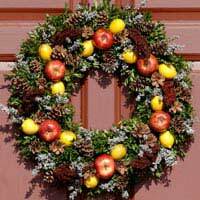 Many autumnal wreaths use fruit such as apples, oranges, lemons and limes in their displays. Whole pineapples, or personal pineapples, may also be used on wreaths and mini pumpkins and gourds are particularly autumnal as well. Cooler autumn temperatures will help fruit stay fresher for longer, but eventually the life span of a fruit wreath is limited due to rotting. Fresh fruit can either be attached to skewers and inserted into the wreath foundation, glued on top of the wreath (though this works best for smaller fruits), or attached via wire run from the front of the fruit to the back of the wreath and twisted to keep larger fruits in place. Apples, and possibly other fruits, can be dipped in floor wax prior to being put into the wreath to help keep a nice shine and even ward off rotting for a little while. This may be better for wreaths intended for display indoors, however, so that the wax coating doesn't harm any wildlife which may try to nibble the wreath. Fresh citrus fruits often have a good lifespan when used in wreaths, and their tough peels help them weather the elements. Dried apple, orange, lemon, lime and grapefruit slices are commonly used in decorative autumn wreaths, as are spices such as cinnamon sticks and bay leaves. Dried fruit slices can easily be glued to twig wreaths, or they can be strung on wire or even fabric to create an easy circular wreath. Dried fruit slices can also be strung very simply to make a garland. Brushing shellac over dried fruit slices will help preserve them. Dried fruit wreaths typically last longer than wreaths made with fresh fruit, but should still be checked consistently for signs of wear and tear and discarded at the end of the season, or the year at the very most, if the fruit slices were not treated with any other material. Fake fruit is perhaps the simplest option to work with, not to mention the longest-lasting material, when making autumn wreaths. Fake fruit does not spoil, can withstand different types of weather, is generally unaffected by rougher handling, lasts for years and can be simply glued onto any wreath foundation or even onto flower or foliage arrangements. If fake fruit is very inexpensive, however, it may not look as well as fresh or dried fruit and may be damaged by inclement weather. Fake fruit can be purchased as craft or floral supply stores, specialty stores and via online retailers. Creating wreaths with fruit should be a joy each autumn. Whether it's fresh fruit, dried fruit or fake fruit, this particularly autumnal look is always a big hit with consumers, easy to create and allows for endless imaginative arrangements each year. At a recent county show I came across a beautiful stand that had wreaths and decorations made from dried fruit. The difference was the colour. They were amazing. When I asked how they kept their colour the owner said they were from SouthAfrica, and naturally dried.Any one know a wholesaler that may sell these.I know where to get the normal stuff but not South African.Help.